The trojan points are those labelled L4 and L5, highlighted in red, on the orbital path of the secondary object (gray), around the primary object (yellow). In astronomy, a trojan is a small celestial body that shares the orbit of a larger one, remaining in a stable orbit approximately 60° ahead or behind the main body near one of its Lagrangian points L4 and L5. Trojans can share the orbits of planets or of large moons. Trojans are one type of co-orbital object. In this arrangement, a star and a planet orbit about their common barycenter, which is close to the center of the star because it is usually much more massive than the orbiting planet. In turn, a much smaller mass than both the star and the planet, located at one of the Lagrangian points of the star–planet system, is subject to a combined gravitational force that acts through this barycenter. Hence the smallest object orbits around the barycenter with the same orbital period as the planet, and the arrangement can remain stable over time. In the Solar System, most known trojans share the orbit of Jupiter. They are divided into the Greek camp at L4 (ahead of Jupiter) and the Trojan camp at L5 (trailing Jupiter). More than a million Jupiter trojans larger than one kilometer are thought to exist, of which more than 7,000 are currently catalogued. Only nine Mars trojans, 22 Neptune trojans, two Uranus trojans, and a single Earth trojan, have been found to date. Numerical orbital dynamics stability simulations indicate that Saturn and Uranus probably do not have any primordial trojans. The same arrangement can appear when the primary object is a planet and the secondary is one of its moons, whereby much smaller trojan moons can share its orbit. All known trojan moons are part of the Saturn system. Telesto and Calypso are trojans of Tethys, and Helene and Polydeuces of Dione. 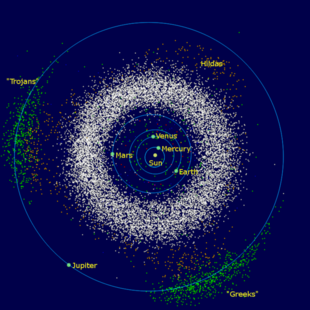 The Jupiter trojans in front of and behind Jupiter along its orbital path, the asteroid belt between Mars and Jupiter, and the Hilda asteroids. In 1772, the Italian–French mathematician and astronomer Joseph-Louis Lagrange obtained two constant-pattern solutions (collinear and equilateral) of the general three-body problem. In the restricted three-body problem, with one mass negligible (which Lagrange did not consider), the five possible positions of that mass are now termed Lagrangian points. The term "trojan" originally referred to the "trojan asteroids" (Jovian trojans) that orbit close to the Lagrangian points of Jupiter. These have long been named for figures from the Trojan War of Greek mythology. By convention, the asteroids orbiting near the L4 point of Jupiter are named for the characters from the Greek side of the war, whereas those orbiting near the L5 of Jupiter are from the Trojan side. There are two exceptions, which were named before the convention was put in place, the Greek 617 Patroclus and the Trojan 624 Hektor, which were assigned to the wrong sides. Astronomers estimate that the Jovian trojans are about as numerous as the asteroids of the asteroid belt. Later on, objects were found orbiting near the Lagrangian points of Neptune, Mars, Earth, Uranus, and Venus. Minor planets at the Lagrangian points of planets other than Jupiter may be called Lagrangian minor planets. Four Martian trojans are known: 5261 Eureka, (101429) 1998 VF31, (311999) 2007 NS2, and (121514) 1999 UJ7 – the only Trojan body in the leading "cloud" at L4, There seem to be, also, 2001 DH47, 2011 SC191, and 2011 UN63, but these have not yet been accepted by the Minor Planet Center. There are 22 known Neptunian trojans, but the large Neptunian trojans are expected to outnumber the large Jovian trojans by an order of magnitude. 2010 TK7 was confirmed to be the first known Earth trojan in 2011. It is located in the L4 Lagrangian point, which lies ahead of the Earth. 2011 QF99 was identified as the first Uranus trojan in 2013. It is located at the L4 Lagrangian point. A second one, 2014 YX49, was announced in 2017. 2013 ND15 is a temporary Venusian trojan, the first one to be identified. The large asteroids Ceres and Vesta have temporary trojans. Whether or not a system of star, planet, and trojan is stable depends on how large the perturbations are to which it is subject. If, for example, the planet is the mass of Earth, and there is also a Jupiter-mass object orbiting that star, the trojan's orbit would be much less stable than if the second planet had the mass of Pluto. As a rule of thumb, the system is likely to be long-lived if m1 > 100m2 > 10,000m3 (in which m1, m2, and m3 are the masses of the star, planet, and trojan). More formally, in a three-body system with circular orbits, the stability condition is 27(m1m2 + m2m3 + m3m1) < (m1 + m2 + m3)2. So the trojan being a mote of dust, m3→0, imposes a lower bound on m1/m2 of 25+√621/2 ≈ 24.9599. And if the star were hyper-massive, m1→+∞, then under Newtonian gravity, the system is stable whatever the planet and trojan masses. And if m1/m2 = m2/m3, then both must exceed 13+√168 ≈ 25.9615. However, this all assumes a three-body system; once other bodies are introduced, even if distant and small, stability of the system requires even larger ratios. Look up Trojan, Trojan asteroid, Trojan moon, or Trojan planet in Wiktionary, the free dictionary. ^ Sheppard, Scott S.; Trujillo, Chadwick A. (June 2006). "A Thick Cloud of Neptune Trojans and their Colors" (PDF). Science. 313 (5786): 511–514. Bibcode:2006Sci...313..511S. doi:10.1126/science.1127173. PMID 16778021. Retrieved 26 February 2008. ^ Joseph-Louis Lagrange (1772). "Essai sur le Problème des Trois Corps" [Essay on the Three-Body Problem] (PDF) (in French). ^ Wright, Alison (1 August 2011). "Planetary science: The Trojan is out there". Nature Physics. 7 (8): 592. Bibcode:2011NatPh...7..592W. doi:10.1038/nphys2061. Retrieved 12 August 2011. ^ Yoshida, Fumi; Nakamura, Tsuko (2005). "L4". The Astronomical Journal. 130 (6): 2900–11. Bibcode:2005AJ....130.2900Y. doi:10.1086/497571. ^ Connors, Martin; Wiegert, Paul; Veillet, Christian (27 July 2011). "Earth's Trojan asteroid". Nature. 475 (7357): 481–483. Bibcode:2011Natur.475..481C. doi:10.1038/nature10233. PMID 21796207. Retrieved 27 July 2011. ^ Whiteley, Robert J.; Tholen, David J. (November 1998). "A CCD Search for Lagrangian Asteroids of the Earth–Sun System". Icarus. 136 (1): 154–167. Bibcode:1998Icar..136..154W. doi:10.1006/icar.1998.5995. ^ "List Of Martian Trojans". Minor Planet Center. Retrieved 3 July 2015. ^ de la Fuente Marcos, C.; de la Fuente Marcos, R. (15 May 2013). "Three new stable L5 Mars Trojans". Letters. Monthly Notices of the Royal Astronomical Society. 432 (1): 31–35. arXiv:1303.0124. Bibcode:2013MNRAS.432L..31D. doi:10.1093/mnrasl/slt028. ^ "List of Neptune Trojans". Minor Planet Center. 28 October 2018. Retrieved 28 December 2018. ^ Chiang, Eugene I.; Lithwick, Yoram (20 July 2005). "Neptune Trojans as a Testbed for Planet Formation". The Astrophysical Journal. 628 (1): 520–532. arXiv:astro-ph/0502276. Bibcode:2005ApJ...628..520C. doi:10.1086/430825. ^ Powell, David (30 January 2007). "Neptune May Have Thousands of Escorts". Space.com. Retrieved 8 March 2007. ^ Choi, Charles Q. (27 July 2011). "First Asteroid Companion of Earth Discovered at Last". Space.com. Retrieved 27 July 2011. ^ de la Fuente Marcos, Carlos; de la Fuente Marcos, Raúl (21 May 2017). "Asteroid 2014 YX49: a large transient Trojan of Uranus". Monthly Notices of the Royal Astronomical Society. 467 (2): 1561–1568. arXiv:1701.05541. Bibcode:2017MNRAS.467.1561D. doi:10.1093/mnras/stx197. ^ Christou, Apostolos A.; Wiegert, Paul (January 2012). "A population of main belt asteroids co-orbiting with Ceres and Vesta" (PDF). Icarus. 217 (1): 27–42. arXiv:1110.4810. Bibcode:2012Icar..217...27C. doi:10.1016/j.icarus.2011.10.016.